Hands On! Tangrams was my first published game project, developed by Island Officials and published by Storm City Games. 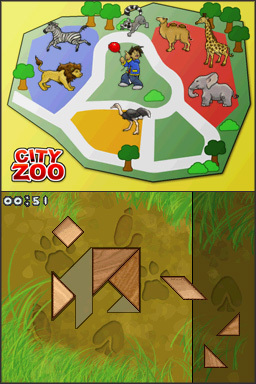 It is a Nintendo DS game based on Chinese tangram puzzles, where the player must arrange a series of seven shapes in order to form a picture. It is primarily targeted toward a young/casual demographic. As the player completes puzzles on the DS’s bottom screen, the puzzle shapes are transformed into simple hand-drawn animations of the character or object, which then transfer to the top screen to complete a larger illustration. There are ten levels in the game, each featuring ten different puzzles, and each level is based around a different theme. This was the first game to be completed by the newly-formed Island Officials, headed by Ryan Morrison and Ryan Harbinson. It was created by a team of roughly 20 people, mostly working in a part-time capacity, over the course of about 13-14 months. The game was released on November 24th, 2009. I served as both a level/interface artist and art director on this project. My individual contributions were all of the art for the Zoo and Fairy Tale levels (levels 1 and 10), including all backgrounds and 2-frame animations, the interface design, and I also worked collaboratively on the Park level (level 6) with multiple other team members. As art director, I was responsible for establishing and maintaining the game’s overall visual style and managing a team of nine artists. In addition to the in-game art, I also created the artwork used on the box and manual for the second printing of Hands On! Tangrams, which better represented the style and objective of the game. This project was one lesson after another. It was my first time working with the Nintendo DS hardware, and the rest of the team’s as well. Island Officials was a fresh, new startup company, and for most of us, this was our first professional game project, having previously worked on PC-based student games. We spent much of the first few months learning about the Nintendo DS’s hardware limitations and how to work within those restrictions. We knew we would be limited to the smallest cartridge size available, so we had to make sure that we controlled our number of art assets and optimized our image compression. I think early on, we were approaching the art too much like we were doing PC development, so we had to change our thinking in that area before we could move forward. This was also the first time I had really found myself in a leadership position, which is a role that I still find myself growing into. I was responsible for solidifying the look of the game, and in the end, I feel that there were definite hits and misses in that area. 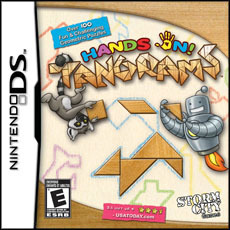 When we were tasked with creating a look for the first “Hands On!” game, I really wanted to draw from my memories of playing with tangrams back in elementary school and the tactile nature of it. I wanted to try to find a way to bring that feeling to the Nintendo DS, which, despite being a digital game system, is played with a stylus and still carries a hint of manipulating the puzzle pieces with your hands. I wanted to play on that idea, so that’s where the interface design filled with construction paper and crayons and wooden blocks and shiny star stickers originated. We actually bought a bunch of craft supplies and experimented with them quite a bit before settling on the final look. Overall, I’m pretty satisfied with the style we came up with, though I do wish we had done more with the visual feedback to make it feel more interactive, such as having the construction paper buttons shift or crumble when pressed rather than just relying on the audio feedback. 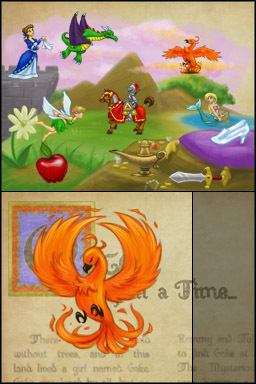 As for the themes and level art, we were going for more of a picture book effect. We didn’t just want a sterile series of shape after shape, but wanted to play on what that shape might translate to in a child’s imagination. We had decided early on that we wanted a different look for each level, which resulted in most of the levels being drawn by a completely different artist. The idea was that this would resemble some of the storybook compilations that we read as kids, with different stories having different illustrators. I’m not sure if this was as successful in practice as it was in theory, and I largely blame myself for not exercising more control over the quality and consistency of the art. It wasn’t until the end of the development process that a lot of the art team really started to find their strengths and use them collaboratively, and I imagine that if we had reached this point sooner, it would have gone a long way toward increasing the overall visual quality of the game. This is one lesson that we have definitely taken to heart while developing the next game in the series, however, and we have taken steps to improve our processes and documentation across the board. Despite our stumbling blocks and the relative simplicity of the game overall, I consider this project to be a huge accomplishment for both myself and my team, and one that I am personally very proud of. We managed to balance our inexperience with passion and determination and were able to build an entire game from the ground up and see it published. The lessons we’ve learned as both developers and as a team have been invaluable and have strengthened us significantly going forward. Copyright © 2019 Karen McKenna. All rights reserved.